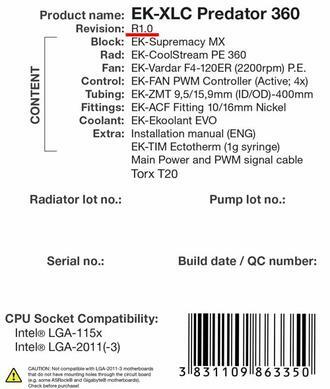 Specialist PC cooling solutions provider EK Water Blocks (EKWB) has issued a product recall. 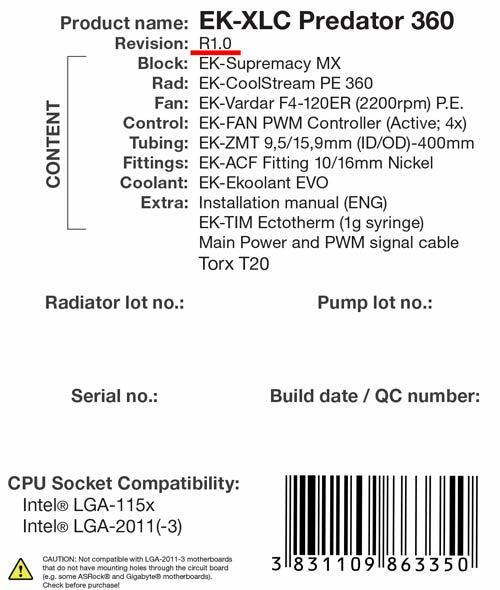 The affected products are the EK-XLC Predator 240 Rev 1.0 and EK-XLC Predator 360 (incl.QDC) Rev 1.0. The recall reason is that these units could potentially leak liquid into users' systems. Customers who own one of the affected units will be able to return it for replacement or refund - with no associated costs. 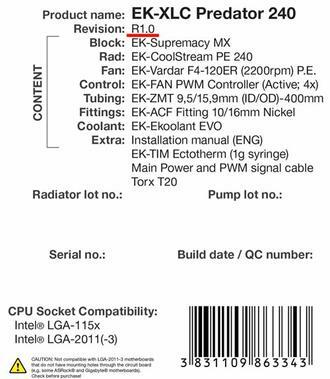 If you are worried that you might own one of the recalled products please check below with particular reference to the EAN codes and identification label examples (click to zoom in). According to the EKWB recall bulletin, the firm initially thought that the leakage problem was of a limited nature but as time marched forward the problem appeared to be more widespread. The firm is thus recalling all Revision 1.0 units of the affected product lines produced from October 2015 until end of December 2015. Current statistics are said to show that 1-in-10 of these products have sprung leaks. 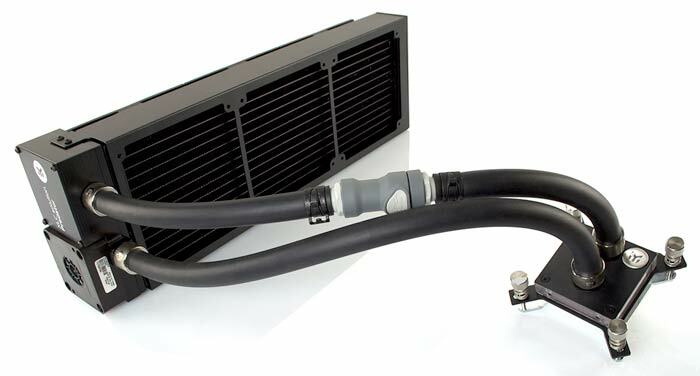 If you have one of the affected units and haven't experienced a leak yet you are still advised to discontinue use of this cooling device immediately and take part in the recall. If you choose to go for a replacement you will receive an EK-XLC Predator (Revision 1.1). You can see the differences in the v1.0 and 1.1 designs in the picture above. To return your product for replacement you can deal directly with EKWB or your reseller. There's an online form provided by EKWB to facilitate a direct return at http://rma.ekwb.com. All shipping charges will be covered by EKWB. If you wish to get a refund EKWB says that you can only do that via your reseller, unless you originally purchased via the EKWB webshop. Resellers have been instructed to accept the Rev 1.0 product returns and issue a full refund if requested, until 29th of February 2016. Your EK-XLC Predator will be replaced by our new Super PREDATOR series,wich uses flowing liquid interface. Air for home PC's remains the safest method of cooling. I'll use my Noctua NC14 for as long as I can. Very happy customer. There's quite a few interesting articles out there on the pro's and con's - best (short) one I've seen is the one on YouTube titled "Should you Watercool your System? Is it worth it?“. Interestingly enough one of the reasons I was thinking seriously about wet cooling for ”build 2016“ was that the top of the line air coolers are now pretty large, and a water cooler would theoretically give me more ”elbow room“. Downside though now seems to be that the EKWB and Swiftech have very deep radiators, so you end up with similar memory module clearance issues as you do with the dry cooling. Which makes me think that maybe I'd be better off handling the (mild) overclocks with a Noctua NH-D15. Okay, it's a big hunk o' metal, but it's reputedly quieter than an AIO water cooler, and obviously doesn't ”suffer“ from the potential for leakage. I've had damned good service from the NH-D14 that I got for ”build 2010“. Getting back to the article - good of EKWB to ”do the right thing" and do a recall, rather than shrugging shoulders and pretend that it's an isolated problem.